Just a quick note to let you know there’s no meeting tonight. The meeting will be next Monday, November 23rd, 7pm. Haven’t yet got the speaker nailed down, but will let you know. If nothing else, we can have a social night. December won’t have a formal speaker or dinner, we’ll just have a drop-in party on the 21st from 7pm at the Shebeen. I’m cross-posting this from raincoastermedia because, well, BECAUSE. 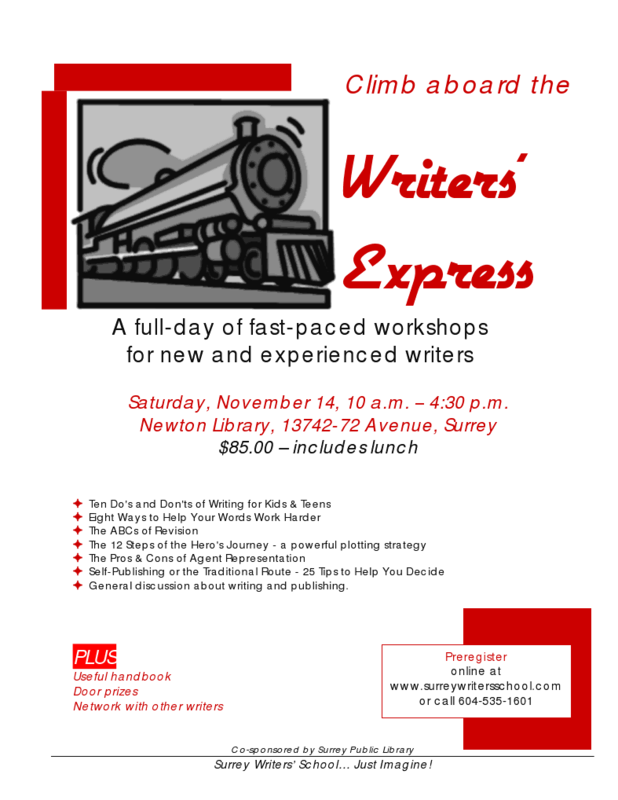 Writers’ Express is a one-day Unconference from the Surrey Writers’ School. These people really know their stuff, and for a full day of these workshops, this is a great price (which includes lunch). 2:45 – 3:30 p.m. Self-Publishing or the Traditional Route – 25 Tips to Help You Decide. Information about 2010 offerings from the Surrey Writers’ School. Door prizes – you must be present to win. Hey all, as everyone I know including me seems to be down with the Hamthrax or equivalent, I’m pushing this week’s meeting back one week to Monday, the 26th of October. We’\ll all be exhausted after the Surrey International Writer’s Conference, but we’ll need a drink! Our featured speaker is Salim Jiwa, former investigative reporter for the Province, and founder of Vancouverite.com, a new hard-news site. He was the basis for the lead in the CBC series Jinnah on Crime, and he’ll be sharing his tales about being an intimate part of many of the major crime cases of our time and our city. See you then: 7pm, Monday, October 26th at the Shebeen. Pass it on! You’re gonna love this. At least, you’re gonna love this if you’re sick and tired of being expected to work for free. Well, if you’re sick and tired of working for free and not phased by rampant, spittle-flecked profanity. I, myself, find it’s my metier. Frankly, after that I’d be too SCARED not to pay him.